Gold price after reaching the resistance level of 4/8 Murray or 1340.62 could not consolidate above it, and the instrument is now trading at the level of 1332.43. The nearest target for sellers is at 2/8 or 1328.13. The price is under pressure due to yesterday news that Donald Trump would postpone the increasing of trading fees on steel and aluminum until next week. If the Republicans cannot persuade the President, America can enter a trading war. Other countries’ leaders have reacted negatively to Trump’s idea and stated that they would take countermeasures, which would weaken the US production and decrease USD against gold as a result. The second negative factor for the dollar is the President Advisor Gary Cohn to resign. Apparently, he could not reach a compromise with Donald Trump on the protectionism issue. On the other hand, as Fed’s policy is tightening, it will support USD and will not let gold price to grow significantly. Today ADP Employment Change and Trade Balance data will be released in the USA. Stochastic is на отметке 77 points and does not reflect the possibility of the correction. 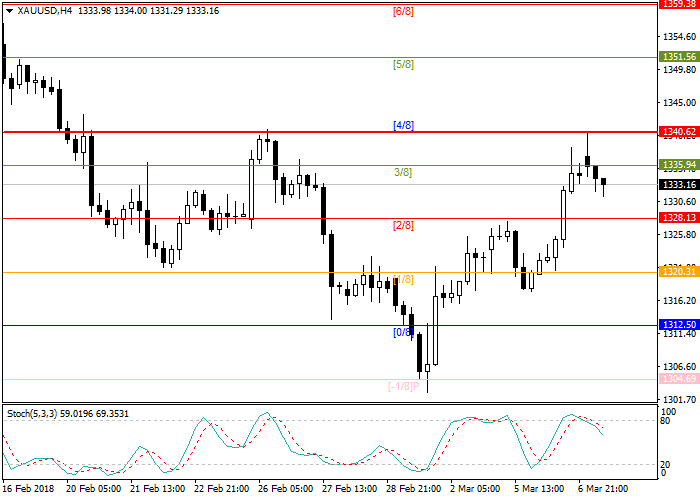 Long positions can be opened at the level of 1328.13 with the target at 1340.62 and stop loss 1320.31.